The Boise Committee on Foreign Relations (BoiseCFR) is a non-profit, non-partisan group of Southern Idaho's Treasure Valley area business, professional and other persons interested in international relation issues and dialogue. The primary goal of the BoiseCFR is to advance the public information and dialogue on foreign relation issues. The BoiseCFR is now in its 74th year of promoting foreign relations diologue in Boise. We have already scheduled several meetings for the 2018-2019 speaker season. For details on the upcoming speakers for this season's meetings, go to our Coming Events page. Our January 2016 dinner meeting with Ambassador Thomas Pickering had a then record attendance of over 130. Since that time we are now averaging nearly that number at every meeting. The BoiseCFR's regular season of dinner meetings run from September through May with an occasional June meeting. The speakers are knowledgeable international and national experts on a wide variety of foreign policy topics. These speakers provide insights and perspectives about current foreign relation issues that are often hard to obtain from other sources. To get a feeling for the topics and quality of our speakers, go to the Past Speakers page where you will find a short bio and the presentation topic of our most recent speakers. A typical meeting starts as a social period with fellow members, guests, and the speaker prior to dinner. After dinner there is a short announcement and introduction period. The speaker's presentation is then given, and the meeting ends with an open Q & A session with the speaker. If these meetings are something you might find interesting, please go to our Membership page to get further details about joining. 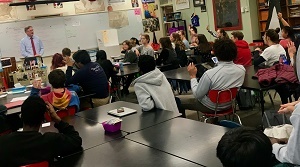 In order to help improve this local diologue, the Boise Committee on Foreign Relations often provides its speakers to local universities and public schools to help inform students on foreign policy issues. Former Ambassador Niels Marquardt speaks to a Boise High School Government and Politics class in December of 2018. He talked about his experiences as a U.S Ambassador to several contries in Africa. 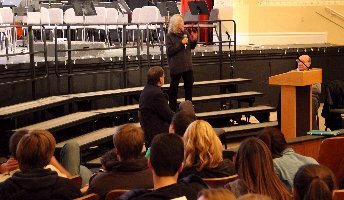 The picture on the right Shows Ambassador Vicki Huddleson talking to several hundred Boise High School students in December 2012 just prior to her speaking at a BoiseCFR meeting about North Africa. Her presentation and discussion turned out to be very timely, with a major uprising occuring in Mali only a few weeks later. On the left Abdulwahab Alkebsi has a fireside chat with Boise State University International Business students and faculty in November 2013. Mr. Alkebsi was in town to talk with the Boise Committee about the Post-Arab Spring in the Middle East. Peter Yeo our January 17, 2019 speaker was interviewed in the "Boise Weekly". His article can be found at: BoiseWeekly.com. Our October 17, 2018 meeting was with Ambassador Emily Haber, Ambassador of the Federal Republic of Germany to the United States, and Ambassador Henne Schuwer, Ambassador of the Kingdom of the Netherlands to the United States. There was a presentation from ACROSS THE POND IN THE FIELD, with discussions on "U.S. - Europe Relations". An article has been published in ForeignPolicy.com about the ambassador's trip to Boise and the BCFR meeting. Go to their link to read the article. "Consul of Mexico Celso Delgado greets former U.S. 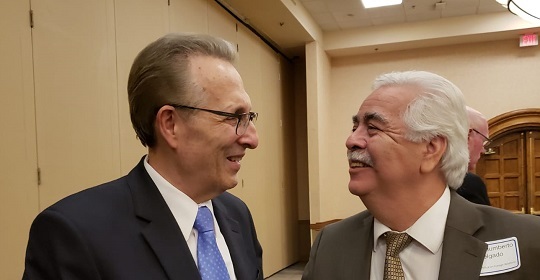 Ambassador to Mexico Earl Anthony Wayne who spoke to the Boise Committee on Foreign Relations September 19, 2018." Our March 2018 speaker talked about "Turkey". Amanda Sloat recently published several articles. One is an Op-ed article on March 18, 2018 on the Idaho Stateman website at: "Why does a foreign policy scholar visit Boise? ‘I came because we are one America". One of her other foreign relations article is available on the Brookings Institution dated February 2018 is at: "Get ready for Secretary of State Mini-Trump". A second is available on the Brookings Institution website also dated February 2018 is at: "The West’s Turkey conundrum". Another article published by Amanda Sloat is available in Foreign Policy Magazine. The following is a link, dated January 23,2018 is available at: "Turkey Wants to Crush U.S. Allies in Syria. That Shouldn’t Surprise Anybody." Our November 8, 2017 meeting with Andrew Whitaker, British Consulate-General in San Francisco was noted in an article in a Boise Weekly interview at: "Andrew Whittaker - On Her Majesty's not-so-secret service"
Our October 3, 2017 meeting with Daniel Benaim was on "The Trump Administration and the Middle East". He has a October 6,2017 interview on Boise State Public Radio with George Prentice, Go to this link to hear this interview: "Daniel Benaim Interview"
Our March 6, 2017 meeting with Derek Shearer was on "American Hard Power and Soft Power: The Emerging Trump Foreign Policy". He has a March 20,2017 article published in Boise State's "Blue Review". Go to this link for his article entitled "Adjusting to Reality"
Our March 14, 2016 meeting with Consul General James Hill of Canada makes these recent comments by the Canadian Prime Minister's very timely. Go to the following line to get the Prime Minister's comments: "Trudeau say Americans should pay more attention to the world"
Also the meeting of Prime Minister Trudeau with President Obama has sparked discussions about Canada and the US in this March 8. 2016 on-line article on the Brookings website. "Bringing Canada 'back' for the long haul "
Our November 2015 Speaker, Frederic Hof has published his Boise Committee on Foreign Relations talk about Syria, that he delivered November 9, 2015. It can be read at the following link: "A Problem from Hell: Dealing with the Crisis in Syria "
Our November 2015 Speaker, Frederic Hof has written and article about Syria dated October 14, 2015. It can be read at the following link: "I Got Syria So Wrong"
Our June 2015 speaker, Steven Pifer was interviewed by Nate Hoffman of the BSU Blue Review during Amb. Pifer's BoiseCFR speaking engagement in June. It was posted on 6/15/2015 and can be found at this link: "TBR Interview: Former U.S. Ambassador to Ukraine Steven Pifer"
Our June 2015 speaker, Steven Pifer has written an article about the Ukraine posted 5/7/2015. It can be found at this link: "What's next in eastern Ukraine? More of the same." BoiseCFR member Don Liebich has written several articles and a book about the middle East. His most recent article dated 3/8/15 can be found at this link: "Six things you need to know in order to understand ISIS". His book is titled "Fault Lines: The Layman's Guide to Understanding America's Role in the Ever-Changing Middle East". Our January 2015 speaker, Mike Kofman published an article about Russia in the "The National Interest" magazine dated 2/5/15. It can be found at "How to Start a Proxy War with Russia". The Boise Committee on Foreign Relations is a member of the American Committees on Foreign Relations (ACFR). The ACFR is the umbrella organization for BoiseCFR and other committees across the nation. Through its office and connections in Washington, D. C., the ACFR provides the major source of speakers for the local committees. CLOSING KEYNOTE SPEAKER: Ambassador Patrick Duddy, Visiting Senior Lecturer at Duke University and former U.S. Ambassador to Venezuela. Jason Marczak, Director of the Atlantic Council's Adrienne Arsht Latin America Center and former Director of Policy at the Americas Society/Council of the Americas (AS/COA) and senior editor of Americas Quarterly magazine. Eric Olson, Director of the Central America-D.C. Platform for the Seattle International Foundation and a consultant to the Wilson Center’s Latin American Program and Mexico Institute. Ted Piccone, Senior Fellow in the Project on International Order and Strategy and Latin America Initiative in the Foreign Policy program at the Brookings Institution. Ana Quintana, Senior Policy Analyst for Latin America & the Western Hemisphere at the Heritage Foundation and former National Security Fellow with the Foundation for Defense of Democracies. Katya Rimkunas, Regional Deputy Director for Latin America and Caribbean programs at the International Republican Institute (IRI) where she leads and manages programs that strengthen democratic institutions and processes in 15 countries. Peter Schechter, Co-host of ALTAMAR and former Senior Vice President for Strategic Initiatives and founding director of the Adrienne Arsht Latin America Center at the Atlantic Council.